FREE VALUATION. To buy, auction, sell or consign your JRR Tolkien Lord of the Rings 1st Edition set that is for sale, please email Nate@NateDSanders.com or call the Nate D. Sanders Auction House (http://www.NateDSanders.com) office at (310) 440-2982. J.R.R. Tolkien’s Lord of the Rings trilogy is a tale of friendship, adventure, love and heroism across several walks of life who band together to defeat the evil power across their realm. The first installment of the trilogy, The Fellowship of the Ring, was first published in 1954 and was a sequel to Tolkien’s The Hobbit. The trilogy remains a fantasy/adventure classic over sixty years since its original publication with multiple feature film adaptations. Very rare first edition, early printing set of J.R.R. Tolkien’s “Lord of the Rings” trilogy. London: George Allen & Unwin Ltd., 1954 & 1955. All three are in extraordinarily near fine condition for both the books and their original dust jackets. “The Fellowship of the Ring” is a first edition, first printing (London: George Allen & Unwin, 1954) with map attached to rear flyleaf. Publisher’s red cloth with gilt spine titles. With signature mark “4” at the bottom of page 49. Original dust jacket priced “21s net”. “The Two Towers” is a first edition, second printing (London: George Allen & Unwin, 1954) with map attached to rear flyleaf. Publisher’s red cloth with gilt spine titles. Original dust jacket priced “21s net”. “The Return of the King” is a first edition, first printing (London: George Allen & Unwin, 1955) with map attached to rear flyleaf. Signature mark “4” present on page 49, and all lines of type sag in the middle. Publisher’s red cloth with gilt spine titles. Original dust jacket priced “21s net”. All measure 5.75″ x 9″ with top edges red. A beautiful set with only minor edge wear, toning to endpapers and very light wear to jackets. One of the nicest “Lord of the Rings” sets available. Sold for $14,588. 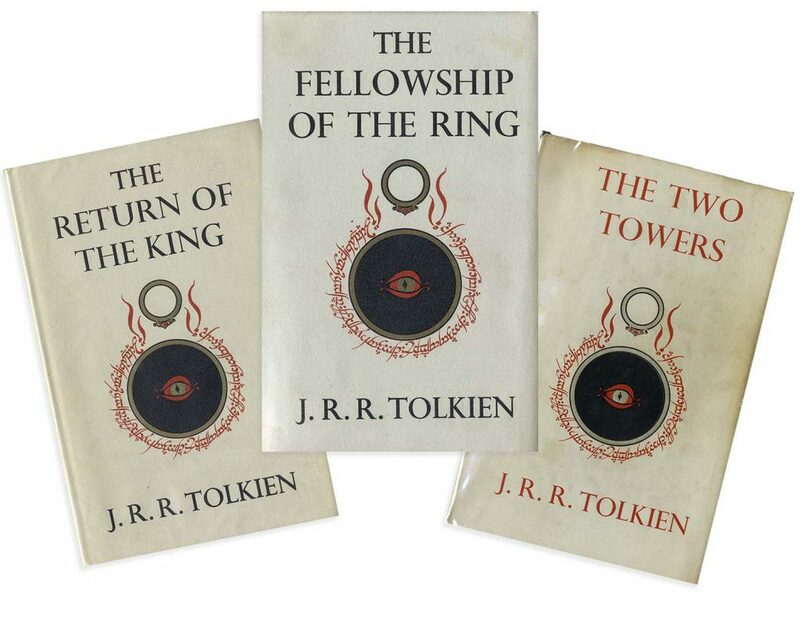 First Edition Set of Tolkien’s “Lord of the Rings” — “Fellowship of the Ring” & “Return of the King” Are First Printings; “Two Towers” Is Second Printing. Click to enlarge. Please let us know if you have a JRR Tolkien Lord of the Rings 1st Edition set for sale. Top dollar obtained for your JRR Tolkien Lord of the Rings 1st Edition set. Rare first edition, second printing set of J.R.R. Tolkien’s “Lord of the Rings” trilogy. London: George Allen & Unwin Ltd., 1954 & 1955. All three books are well-preserved, in their original dust jackets and with maps present. “The Fellowship of the Ring” is a first edition, second printing (London: George Allen & Unwin, 1954) with map attached to rear flyleaf. Publisher’s red cloth with gilt spine titles. With signature mark “4” at the bottom of page 49. Original dust jacket with price clipped. “The Two Towers” is a first edition, second printing (London: George Allen & Unwin, 1954) with map attached to rear flyleaf. Publisher’s red cloth with gilt spine titles. Original dust jacket priced “21s net”. “The Return of the King” is a first edition, second printing (London: George Allen & Unwin, 1955) with map attached to rear flyleaf. Signature mark “4” present on page 49, and type sagging in the middle. Publisher’s red cloth with gilt spine titles. Original dust jacket priced “21s net”. All measure 5.75″ x 9″ with top edges red, though red has faded for “Fellowship” and “Two Towers”. 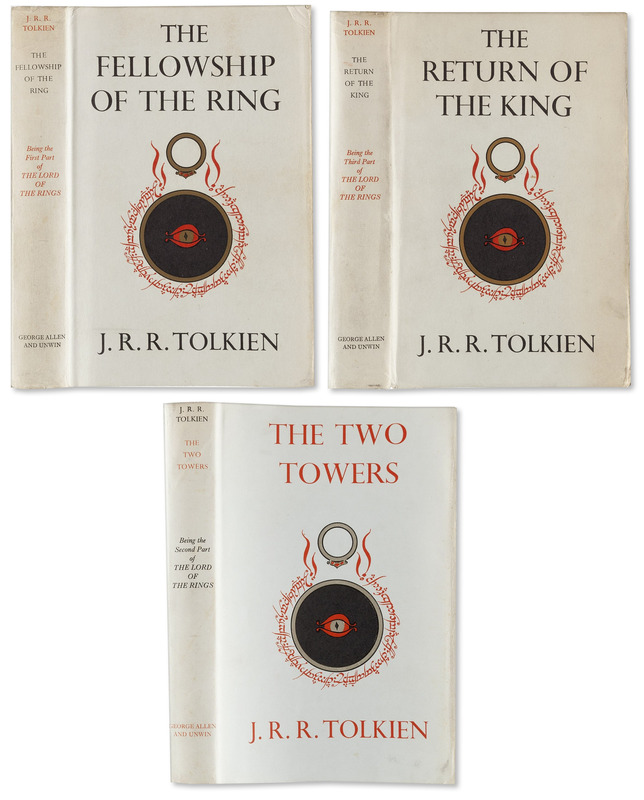 Apart from some light mottling to the front board of “Fellowship”, it and “Return of the King” are in near fine condition, both books and dust jackets; “Two Towers: shows some cocking to spine, sunning to backstrip and toning to endpapers. Overall a very good plus set, with excellent display quality. Sold for $5,775. First Edition Set of J.R.R. Tolkien’s “Lord of the Rings” — A Complete Second Impression Set in Their Original Dust Jackets, With Maps Present﻿. Click to enlarge. Appraise JRR Tolkien Lord of the Rings 1st Edition. Auction JRR Tolkien Lord of the Rings 1st Edition. Sell JRR Tolkien Lord of the Rings 1st Edition. Consign JRR Tolkien Lord of the Rings 1st Edition. Buy JRR Tolkien Lord of the Rings 1st Edition. JRR Tolkien Lord of the Rings 1st Edition prices realized. JRR Tolkien Lord of the Rings 1st Edition consignment. JRR Tolkien Lord of the Rings 1st Edition for sale. JRR Tolkien Lord of the Rings 1st Edition auction. JRR Tolkien Lord of the Rings 1st Edition estimate. JRR Tolkien Lord of the Rings 1st Edition valuation. JRR Tolkien Lord of the Rings 1st Edition worth. JRR Tolkien Lord of the Rings 1st Edition appraisal.